New York State, through its USA Niagara Development Corporation, has completed the purchase of 31 parcels previously owned by Tuscarora businessman Joe Anderson. The purchases, state and city leaders say, are needed to continue the redevelopment of the city's entertainment and tourism districts. The parcels total 9.5 acres, according to Empire State Development, and include properties acquired from Tuscarora businessman Joe Anderson, including the Niagara Adventure Park, or "snow park" as it was referred to by state and city officials. Another Anderson holding bought in the $14 million purchase was the former TeleTech building at First and Old Falls Streets, which later became Smokin Joe's Native Center. The Niagara Adventure Park, seen at left, and Smokin' Joe's Native Center at right are two of the larger properties acquired by the New York State-run USA Niagara Development Corporation. 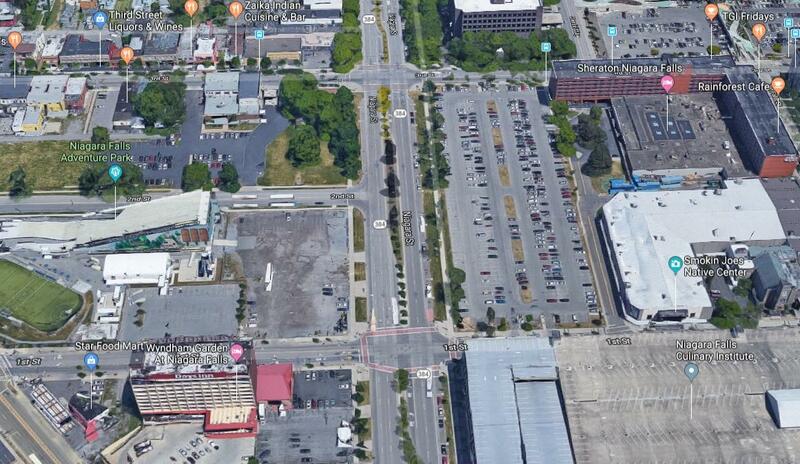 In all, 31 parcels in downtown Niagara Falls have been purchased by the state for $14 million with the intent to attract private investors for redevelopment. Also acquired are four buildings alone Third Street, including one which is an art deco structure and, according to USA Niagara Development acting president Paul Tronolone, could be eligible for historic tax credits. "The larger parcels, some of them date back to some of the urban renewal eras, some like the former TeleTech complex which actually wraps around a historic church in kind of an odd shape," Tronolone said. "It might require some further investment to maybe raze the property, break it up into several parcels." Mayor Paul Dyster supports redeveloping that block into smaller properties with which the church would be a better fit. "Now that entire property can be returned to a use, maybe more like the way that property was used back in the days when Old Falls Street was thriving," Dyster said. The four buildings along Third Street, meanwhile, are envisioned as properties which could be acquired by private interests for a mix of residential and commercial uses, such as restaurants and shops. "If those four parcels were to come back into active use, I think it's a dramatic boost to the fortunes of Third Street, which is our entertainment district down adjacent to the downtown tourist district," Dyster said. The mayor explained the city had run into the problem of having more interest by investors than land available for them. Acquiring these parcels is seen as the next step in the Cataract City's redevelopment, which already has witnessed the removal of a portion of the former Robert Moses Parkway for a conversion into the more green-minded Riverway project. Tronolone said more parkway will soon be pulled out. "Now we're seeing the next stage of that just starting, a two-mile extension from downtown Niagara Falls all the way up to Whirlpool State Park, where the parkway will be removed and will basically create a 12-acre unbroken ribbon of open space," Tronolone said. "Along which, we're hoping new things can happen. Some of these new lands that we're acquiring abut that new open space being created." One Anderson-owned property that was left out of the deal was his Quality Inn Hotel and Suites at Old Falls Street and Rainbow Boulevard. The Niagara Gazette reported the state was interested in this property as well but complications with transferring liquor licenses resulted in leaving that out of the deal. Dyster, who is leaving office at the end of this year, stated in his recent State of the City address that the psychology of the city, especially its north end, has changed with new projects coming in. "If you think about when early decisions were being made, opening up access to the waterfront in Buffalo, it hadn't happened yet but there was this feeling of inevitability when people started seeing the construction equipment moving in," he said. "It's like 'oh my gosh, this is really happening, we're regaining access to our waterfront.' People had started thinking about all of the possibilities, all of the potential that had been taken away from them for all those decades. That's about the psychological state that we're in in Niagara Falls. "I think there are some of us, that after 20 years of advocacy (to tear down the Robert Moses Parkway) are pinching ourselves, saying 'oh my gosh, I can't believe it, it's finally happening.'" Niagara Falls Mayor Paul Dyster delivered his final State of the City address Monday, looking back on the accomplishments of his administration while offering signs of hope for the next mayor and the students in his audience. There is now a rough cost and time schedule for removal of a major section of the Robert Moses Parkway in Niagara Falls. The price tag for the project is estimated to be $34 million.